EAST MOLINE, Ill.--(BUSINESS WIRE)--Standard Forwarding, a U.S. less than truckload (LTL) carrier and subsidiary of DHL Freight, has earned “Partner-level” status in John Deere’s Achieving Excellence supplier recognition program for the eighth consecutive year. Standard Forwarding was also named Great Lakes/Midwest LTL Carrier of the Year (2013) in Mastio & Company’s annual Value and Loyalty Benchmarking Study. It was the sixth time in a row that Standard Forwarding won the coveted award. Suppliers in John Deere’s Achieving Excellence program are evaluated in several key performance categories: quality, cost management, delivery, technical support and wavelength, which is a measure of responsiveness. John Deere Supply Management created the program to provide a supplier evaluation and feedback process that promotes continuous improvement. The Mastio study surveys 2,000 shippers and identifies and quantifies the needs of LTL freight customers while comparing national, regional and local carriers. Standard Forwarding was selected as the winner based upon top scores in 24 service attributes determined to be most important to LTL customers. 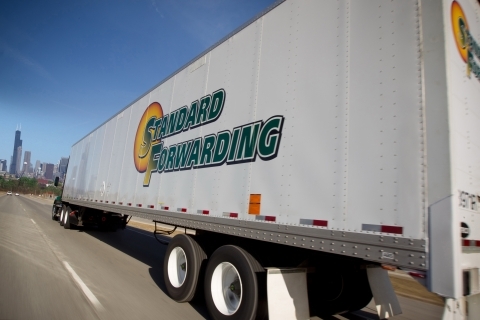 Standard Forwarding is a Midwest regional LTL carrier with service in Illinois, Iowa, Indiana, Minnesota, Wisconsin, St. Louis, Missouri, Omaha, Nebraska, and southern Michigan. The company has won numerous service awards. Standard Forwarding is a wholly owned entity of DHL Freight, the road freight arm of Deutsche Post DHL, the world’s leading logistics group.